Presentation of Award by District Governor Ian Dow LtoR: President Elect Dale Hatton, Alison Stedman, District Governor Ian. District Governor Ian was at a recent meeting to present the International Service Award which, is awarded annually for overseas projects. 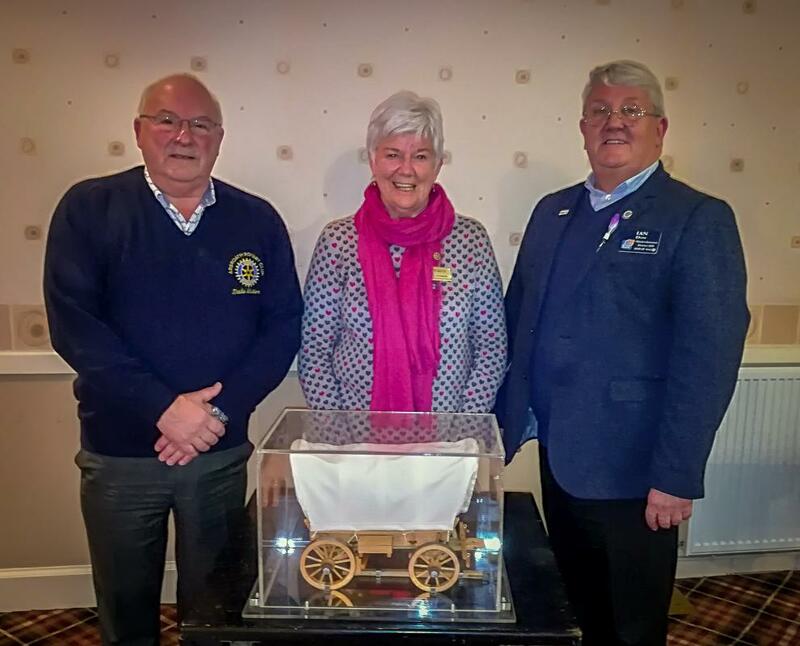 it was jointly won by The Rotary Club of Arbroath for the Nyumbani (HIV/AIDS Orphans) Project in Kenya and The Rotary Club of Ellon for their First Steps Himalaya-Childhood Development Project in Nepal. The Nyumbani Project led by Alison Stedman last year raised £67,000 for the equipping of a diagnostic laboratory in Nyumbani Home for HIV+ Orphans. The award is a scale model of a Conestoga Wagon which was used in the opening up of the Canadian frontier and was given to the District in 1972 by The Rotary Club of Kitchener, Canada during a goodwill and fellowship visit.